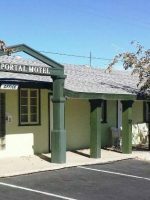 Established by the U.S. Borax Company in 1927, the Inn at Furnace Creek has grown far beyond its initial 12 guestrooms. 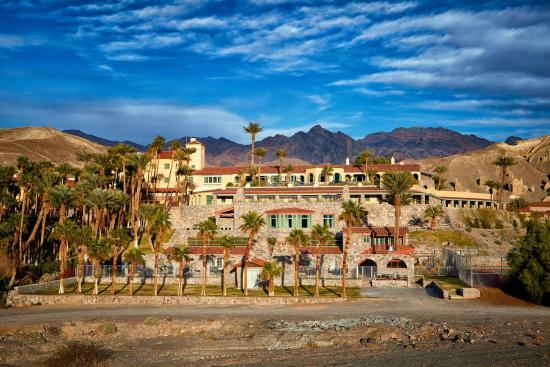 While considered the most upscale place to stay inside Death Valley, the Old West-style Furnace Creek Inn and Ranch Resort has two parts — the “inn” section and the “ranch” section. Families, especially those with young kids, would be wise to pick the ranch. Less expensive than the inn, it’s also more family-friendly. The inn, which is about a mile away, is considered an upscale, romantic getaway for couples. 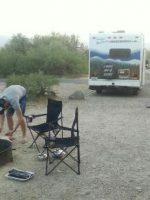 For families who are especially thrifty or want a different experience, there’s also an onsite camping area. 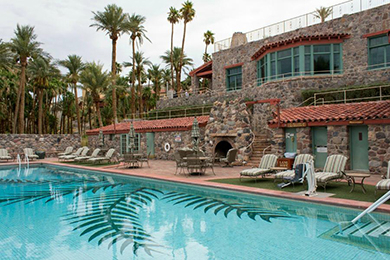 While the intense heat in Death Valley can make it tempting to stay indoors, there’s plenty to do at the Ranch, with a playground, a spring-fed pool and access to bocce ball, shuffleboard, basketball, volleyball and tennis. For an additional charge, visitors can go on guided horseback and carriages rides or rent bicycles. Rooms have been recently refurbished, and though on the small side, have in-room coffeemakers and mini-fridges to make guests feel at home. Cribs and rollaway beds are available for an additional charge. Cabin units aren't actually cabins in the traditional sense -- instead, they are rooms located in single story duplex buildings near the registration/reception building. All units are non-smoking and have either two double beds or one queen size bed, air conditioning, hairdryers, in-room coffeemakers, mini-refrigerators, TVs, phones and 3/4 private baths (shower only). These are decidedly cozy accommodations and probably best for couples or small families -- rollaways are not available in these units. One perk is that it's easy to park in a space next to your cabin, and you can sit right in a rocking chair right outside your front door. Wi-Fi is free, but spotty and slow. 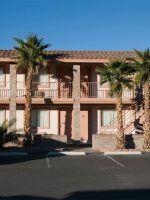 Located in one of four two-story buildings, all standard rooms are non-smoking and have French doors leading to small patios or balconies. All units have two queen beds, air conditioning, hairdryers, in-room coffeemakers, TV, phone, full private bath and mini-refrigerators. Rollaways are permitted in these rooms. Most rooms have a small table with chairs, but don't expect to seat the whole family. Wi-Fi is free, but spotty and slow. Some rooms are adjoining and can be requested when you make your reservation. Deluxe rooms are located in two single-story buildings. Rooms are non-smoking and have French doors leading to small patios adjacent to the pool area, which may be a turn off for parents of toddlers, but a selling point to families with older kids. Most rooms offer two queen beds and a limited number have one king bed. Each unit offers air conditioning, hairdryers, in-room coffeemakers, TV, phone, full private bath and mini refrigerator. Some units are fully handicapped accessible. Rooms with roll-in showers and pool access are available. Wi-Fi is free, but spotty and slow. Some rooms are adjoining and can be requested when you make your reservation. 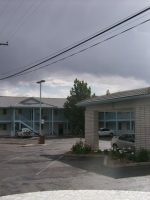 Standard rooms have views over the oasis garden, desert vistas or Panamint Mountains and have a king bed. Some of the rooms have a full bath and some have a 3/4-bathÂ with a shower only. These rooms may be located in either the main tower or on the terrace level above the pool. Rates are based on double occupancy, and additional adults are $20 per person, per night. Rollaway beds are available for $20 a night. Wi-Fi is free, but spotty and slow. Transportation to and from the Furnace Creek Airport, the National Park Service Visitor Center and within the Resort is included. Each unit offers air conditioning, in-room coffeemakers, a TV and phone. The Standard Terrace Rooms are located on the Terrace above the pool and offer garden, desert or mountain views. Some rooms have a full bath and some have a Â¾-bath with a shower only. Rates are based on double occupancy, and additional adults are $20 per person, per night. Rollaway beds are available for $20 a night. Wi-Fi is free, but spotty and slow. Transportation to and from the Furnace Creek Airport, the National Park Service Visitor Center and within the Resort is included. Each unit offers air conditioning, in-room coffee makers, TV and phone. 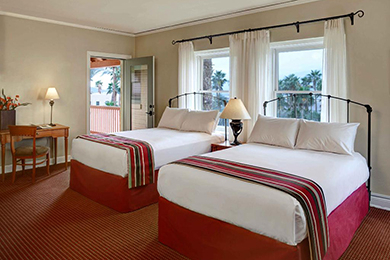 Deluxe Rooms are slightly larger rooms that have views of the oasis garden, desert vistas or Panamint Mountains. Guests enjoy a king-size bed with a full bath. Rates are based on double occupancy, and additional adults are $20 per person, per night. Rollaway beds are available for $20 a night. Wi-Fi is free, but spotty and slow. Transportation to and from the Furnace Creek Airport, the National Park Service Visitor Center and within the Resort is included. Each unit offers air conditioning, in-room coffeemakers, TV and phone. These rooms have a double and twin bed and located in the North Wing. Guests can choose a garden or desert view and most rooms connect to a Deluxe King room. Rates are based on double occupancy, and additional adults are $20 per person, per night. Rollaway beds are available for $20 a night. Wi-Fi is free, but spotty and slow. Transportation to and from the Furnace Creek Airport, the National Park Service Visitor Center and within the Resort is included. Each unit offers air conditioning, in-room coffeemakers, TV and phone. These spacious rooms are located in the North Wing. Along with garden and desert views, these rooms feature a king bed, a full bath and a spa tub. Rates are based on double occupancy, and additional adults are $20 per person, per night. Rollaway beds are available for $20 a night. Wi-Fi is free, but spotty and slow. Transportation to and from the Furnace Creek Airport, the National Park Service Visitor Center and within the Resort is included. Each unit offers air conditioning, in-room coffeemakers, TV and phone. These rooms have two double beds and are located in the North Wing. Additional amenities include a sharedÂ deck or terrace, as well as a spa tub. Rates are based on double occupancy, and additional adults are $20 per person, per night. Rollaway beds are available for $20 a night. Internet is free, but spotty and slow. Transportation to and from the Furnace Creek Airport, the National Park Service Visitor Center and within the Resort is included. Each unit offers air conditioning, in-room coffeemakers, TV and phone. These non-view rooms feature a king bed with full bath (some without tub). Rates are based on double occupancy, and additional adults are $20 per person, per night. Rollaway beds are available for $20 a night. Wi-Fi is free, but spotty and slow. Transportation to and from the Furnace Creek Airport, the National Park Service Visitor Center and within the Resort is included. Each unit offers air conditioning, in-room coffeemakers, TV and phone. One-bedroom suites include a king-size bed, and the added space of an attached living room. Rates are based on double occupancy, and additional adults are $20 per person, per night. Rollaway beds are available for $20 a night. Internet is free, but spotty and slow. Transportation to and from the Furnace Creek Airport, the National Park Service Visitor Center and within the Resort is included. Each unit offers air conditioning, in-room coffeemakers, TV and phone. This bungalow is just outside the swimming pool and has a view of the Death Valley desert. This stand-alone room includes a queen bed and full bath. The solid stone walls are sourced from the surrounding desert and the bungalow has a vaulted ceiling. Rates are based on double occupancy, and additional adults are $20 per person, per night. Rollaway beds are available for $20 a night. Internet is free, but spotty and slow. Transportation to and from the Furnace Creek Airport, the National Park Service Visitor Center and within the Resort is included. Each unit offers air conditioning, in-room coffeemakers, TV and phone. Dumpy little rooms with cockroaches for $230 a night in off season. WHAT a RIP OFF!!! I cannot begin to express how deeply disappointed we were with The Ranch at Death Valley. I see that it has some good reviews. Maybe it depends what room you are booked in. We were in the cabins. We were the guest of someone else so we could not complain directly. If I had I been paying I would have demanded a different room, or $ back. The room was very small. The wall in front of toilet bowl is only 10" from the toilet, so one has to sit sideways. The shower basin was cracked. There was mold on the tiles. The window was disgusting. There was grime all over the phone. The entrance had mud. Wifi did not work. And the frosting on the cake was the cockroaches. And they charge $230 for this plus a $13 resort fee. I cannot begin to express how awful this place is. Waitress was surly in steak house. The check in process was so s-l-o-w. They charge $3.00 for a soda in the general store. That's worse than a ski resort. Mattress was good. In room coffee was good. Had a new sink. But shelf on bottom was dusty. TV was blurry. Convenient parking. BUT DO NOT GO HERE. Since I had not been here in a very long time, I was pleasantly surprised about the new look and feel of the place. It's like a small town, grocery/gift store, restaurant/pub, outdoor museum, pool, large grassy areas, a golf course a few minutes away ....... I didn't stay here this time but would definitely consider this depending on pricing. Open 7 a,m. to 11 p.m., the Ranch's swimming pool lacks the resort-like feel of its sister pool at the Inn, but for kids, it's an ideal spot for splashing and playing. Fed by a natural spring, the water is 8-feet deep, but take note -- there is no lifeguard. Open year-round. 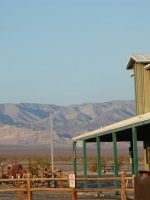 Located at the Ranch at Furnace Creek, the stables offer one- and two-hour guided trail rides, evening carriage and even hay wagon rides. On the nights prior and immediately after a full moon, guest can opt in for a special treat -- moonlight rides. The one-hour horseback ride ($60) covers the valley floor, while the two-hour ride ($75) travels into the foothills of the Funeral Mountains for views of the valley below. The 45-minute carriage ride travels through the lowest golf course in the world and into the Death Valley date palm grove. Carriage rides are $35 per adult, children under 12 are $20 and it's free for kids under 5. The stables are open from mid-October through the second Sunday in May. The bike rental shop, which is located adjacent to the General Store at the Ranch, has 24-speed mountain bikes in sizes for the whole family. Rentals are $15 for an hour, $34 for a half day, and $49 for a full day. Kids' bikes are available for $5 an hour. Bikes can be rented every season except for summer. Reservations can be made at 760-786-3371. Though small, the children's playground is open and accessible all the time, but be weather wise -- during extremely warm weather, the equipment can be very hot to the touch, and children at play can overheat quickly. Consider stopping by in the morning or late in the afternoon. The playground has slides, swings and monkey bars. Even when a family doesn't know the rules of bocce ball, kids of all ages will find the chance to bowl the Italian way intensely satisfying -- especially once they hear the sound of the bocce balls knocking together. The bocce ball court is open year round, as is the neighboring shuffle board court. 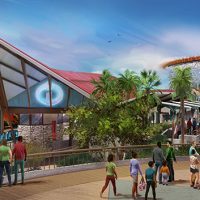 The equipment for both is kept in a nearby shed, and you don't need to check it out if you'd like to play -- the resort works on an honor system. Don't plan on playing late, though -- there are no lights at the courts. Take a minute to shoot some hoops at the basketball court or try out volleyball. Balls are available in the equipment shed, which operates on an honor system, so feel free to drop by anytime -- except after dark. There is no light at either court. While the Inn has two tennis courts, the Ranch also has one of its own. Don't plan on playing mid-day, however, due to the heat. 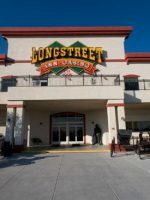 Conveniently located next to the General Store, the Wrangler Steakhouse is low-key spot to grab a bite. Families might enjoy the breakfast buffet, and dinner is a variety of classic steak, fish and pasta dishes. Though entrees can be pricey, you can add the all-you-can-eat soup and salad bar for just $6. Attire is casual and reservations aren't taken. A low-key diner, the Forty-Niner has an extensive menu for your picky eater -- omelets, biscuits and gravy, pancakes, hot and cold sandwiches, soup, salads, fried chicken, vegetarian dishes, and date shakes, plus the usual burgers, pasta dishes and pork chop. The old West-style eatery is pricier than you might expect, but on par with other Death Valley locations -- plus the location will hit the spot. Parents will appreciate the full cocktail service, including varietal wines available for lunch and dinner. Attire is casual and reservations are not taken. Paper and crayons are available for the kids. While more of a sports bar than a kid-friendly eatery, the Corkscrew Saloon may be just the place for older kids to pop in if their favorite team is playing. While the saloon prides itself on its extensive alcohol menu (including Badwater Ale, brewed exclusively for the saloon by Indian Wells Brewing Company), kids will like the pizza, hot dogs and buffalo wings. Attire is casual and reservations are not taken. 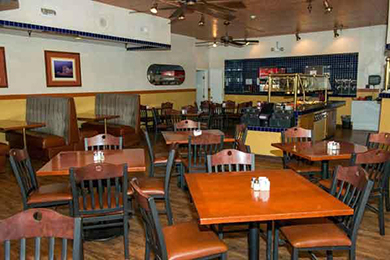 While this is a great spot to grab a burger after golfing at Furnace Creek, it's also a casual choice for families looking to grab breakfast or lunch. You can enjoy views of the golf course and even sit outside if it's not too warm. Kids might get a kick out of watching golf carts pull up to their own take-out window. While there's no fitness center at the Ranch, guests determined to fit in a workout can take the mile-long walk to the Inn to use the small fitness center there. Call ahead to ensure access. Don't plan on taking the trek to the Inn midday -- given the intense heat, a mile will feel like more of a workout than you might realize. A professional massage therapist offers Swedish, deep tissue, hot stone, sports therapy (pre- or post-event) and nurturing massages for mommy-to-be, as well as exfoliating salt scrubs and reflexology. Detox machine treatments for feet and pampering treatments for a comprehensive head-to-toe experience are also available. Massages are offered mid-October through mid-May. Advance reservations are recommended. Children under 18 must be accompanied by an adult or guardian. For more information, call (760) 786-2345 ext 120. The best time to visit Death Valley is in the winter and spring months, when temperatures drop -- though prices for hotel rooms go up. However, it's still best to avoid travel in warmer weather, when temperatures can exceed 120 degrees -- unless you are well prepared to handle the extreme heat. Though the closest airport to Death Valley is McCarran International Airport in Las Vegas, you'll be driving a lot no matter what. Located 120 miles from the airport, Death Valley is easy to reach -- there are just four main roads to follow -- but it can be desolate. Some feel the journey, which takes you through red rock canyons and beautiful views, is the best part of the trip. Don't expect complimentary shuttles, Uber or Lyft in Death Valley -- you will be doing the driving, and there will be a lot of it. You won't want to miss the stunning view (when weather permits, veranda seating is available), and the food ranges from Southwestern to steaks and upscale salads. It's a little dressier than you might expect, so leave T-shirts and tanks in your suitcase. Dinner reservations are recommended. While you can bring the kids in a pinch, this is considered the most elegant and romantic dining choice at the resort, so enjoy it when you have some time alone. The Furnace Creek Golf Course has 18 holes and is the lowest one on earth, and being below 214 feet sea level presents special challenges. The ball does not travel as far, which is a bonus on an extremely hot day. But not everyone who visits the golf course is there to play golf -- the area is also a sanctuary where visitors can walk through and see birds, coyotes, and the many plants that grow in this natural oasis, one of the few in America that isn't in a state park. Leave the kid-friendly pool at the Ranch for a more upscale poolside experience at the Inn. 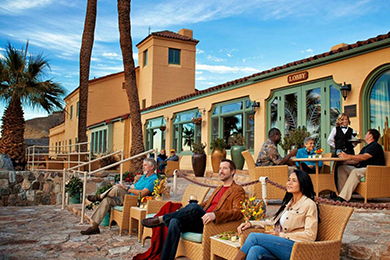 Pull up a lounge chair and sip a cool drink from the full service bar while watching the clouds overhead or a spectacular sunset. 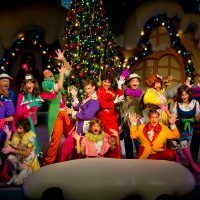 What's New at Disneyland in 2018?